Happy 238th Anniversary of our Independence! The great experiment begun with the American Revolution continues onward, always hitting bumps in the road but eventually getting itself straightened out again. I’m not going to dwell on the bumps, but on those persons who responded to God’s grace in the United States in a particular way, so much so that they became truly holy people. Here are some saints, and some soon-to-be ones whom you might not know about. St Kateri Tekakwitha praying in front of a cross she made in the forest. The Lily of the Mohawks should count as the first American saint since she was born in upstate New York, in 1656, to a Mohawk chief and an Algonquin mother who was a Catholic. At the age of four, she was orphaned in a smallpox epidemic which killed her parents and brother, and left her with a scarred face and weak vision. 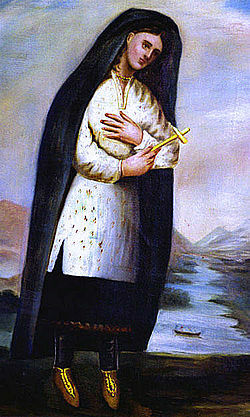 Adopted by an anti-Christian uncle, Kateri moved with him to a newly built Mohawk town, Caughnawaga, which is where she first encountered Blackrobes – the French Jesuit priests who came to North America as missionaries. Her uncle was hostile because one of his daughters had gone north to an Indian Catholic town, and perhaps because the missionaries had been imposed on the Mohawaks after their defeat by the French in 1666. Despite her uncle’s hostility, she was drawn over the years ever close to Christianity, and she was baptized in 1676. That she was baptized after only six months of instruction shows the depth of her faith: many converts were not baptized until they were on their deathbeds! She became a true mystic, speaking to God intimately, enduring persecution, and committed to celibacy so as to be wholly given over to God. She finally escaped to Canada, settling in the Catholic Indian town of Kahnawake. Here she grew even more in Faith, and was revered by both Natives and French. She was mentored in faith by an old friend of her deceased mother, Anastasia Tegonhatsiongo. They were part of a group of women who longed to be nuns, and they practiced many penances to obtain the salvation of their people and atone for sins. When Kateri died, the witnesses said that the smallpox scars left her body, and her face was beautiful and white. She appeared to several people at her death, including the mission priest, Father Claude Chauchetière who saw her for two hours “in baroque ecstasy.” Known for healings across New France, she was canonized in 2012. Early painting shows how Kateri covered herself with a blanket, to hide her scars and shield her eyes. She is meditating on a cross that she made. The first pastor of my home parish was Saint John Neumann. This little unassuming priest was my first Catholic hero. German-Czech priest left old Bohemia to come to the New World to be ordained a priest and to serve as a missionary. He was sent to the Niagara Frontier, a stretch of country along the eastern end of Lake Erie. In those days, Buffalo was a little town, and Father Neumann was sent to minister to German farmers from Alsace-Lorraine in the district of North Bush in 1836. From his base at the log St John the Baptist Church, he went out on horseback to serve parishes from Williamsville to Lancaster, an arduous trek by horseback. In those days one could hear the roar of Niagara Falls, 27 kilometers/ 16 miles away! He left the frontier in 1840 to enter the Redemptorist Order. He founded the system of parochial schools in America (so threatened today with extinction!) and, against his will, served as bishop of Philadelphia. He died there of overwork and exhaustion, and his incorrupt body rests under glass in the lower level of St. Peter’s Church in that city. Saint Elizabeth Ann Seton was the widow of an upper-class New York City merchant, who died in Italy of tuberculosis. From the Protestant Episcopal Church and “old” English families of New York, she created a double scandal in America when she became a Roman Catholic (1805) and later founded the Sisters of Charity to staff Catholic schools, adopting the Rule of St Vincent de Paul in 1810. These Sisters were the first Order to work among the public in the young United States. Mother Seton founded schools and directed her Community in the spirit of St Vincent de Paul and St Louise de Marillac, with deep devotion to the Holy Eucharist, the Bible, and the Mother of God. She died in 1849 and is buried inside the Basilica in Emmitsburg, MD, and was canonized in 1975. Her former home along the southern shore of Manhattan is now a national shrine. This was where she used to walk the docks, begging from the captains of the ships for help for the children she was serving. It was one of my favorite places to visit when I would go to New York City. The Watson House on the right and is now the rectory; the church is where her house stood and was added in 1964 but in the same Federal style. There has been a Catholic parish here since 1884. Mother Seton stands above the church door, with her arms out and facing New York harbor. Saint Rose Philippine Duchesne was born in France in a devout family. She became a Visitation Nun, an order of enclosed Sisters who taught children. She survived persecution in the Revolution’s Reign of Terror after being expelled from her convent along with all other Sisters in France thrown out of their homes. While she was able to join the new Society of the Sacred Heart, a community of Sisters who lived in an open convent and taught in schools, her heart felt called to mission work in the New World. She came to America in 1818. She settled in Saint Charles, Missouri, after a journey of seven weeks from New Orleans. She and her Sisters established schools for both French children and for the new immigrants coming to America. Within ten years, there were six convents with Sisters teaching in schools on the frontier in Missouri and then in Louisiana. At the age of 71 she gave all this up to move to Kansas, to work among the Indians who had been deported there. She served ng the Pottawatomi Indians, especially their sick. To her grief, she could not learn their language, but the children revered her as “The Woman Who Always Prays” and she withdrew to live a life of seclusion in a tiny shack near her first convent at St Charles, Missouri, where she died in 1852. When her body was exhumed in 1855, it was found to be incorrupt. This was buried in a small shrine, but in 1951 Pope Pius XII ordered that she be buried in a more proper church. This was built and her body placed there in 1952. She was canonized in 1988. What a way to be remembered, as a person who always prays! The first Convent of the Sacred Heart – a far cry from France’s comforts! Father Nelson Baker is a famous priest on the Niagara Frontier and now beyond. He was the son of an Irish Catholic mother and German Lutheran father, but after his baptism at age 9, he was raised in the Catholic faith. He served as a Union soldier in the Civil War at Gettysburg and in putting down the New York City draft riots, and at home was a successful businessman. But he gave it all up to become a priest in 1870. 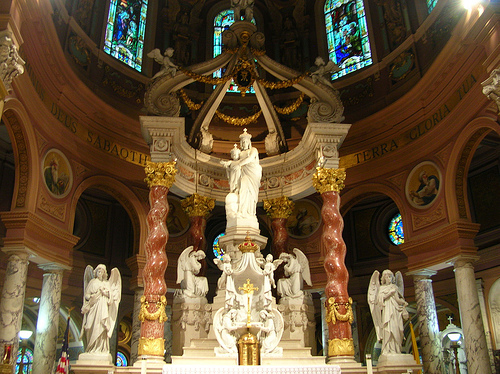 On a pilgrimage to Europe, he was profoundly moved at the shrine of Our Lady of Victories in Paris, and commended himself to Mary’s care under that title. Ordained in 1876, he eventually found his life’s work at the St. Joseph Orphanage, St. John Protectory and St. Patrick church in the factory town of Lackawanna, which is on the south side of Buffalo. In order to pay off the debts of the three institutions, he paid all of his savings to creditors and founded the Association of Our Lady of Victory, writing to Catholic women all over the United States asking for help to support the orphans in his care. This association is still ongoing today. The debts were paid in 1889. In 1891, facing the need to heat the growing colony of buildings at the site, he prayed to Our Lady of Victory, and a natural gas well was discovered on the site. Everything has been heated ever since for free. Father Baker, as he is still known in Western New York, established a new orphanage for boys, home for unwed mothers and babies, hospital, parish school, an apostolate to African-Americans, home for disabled children, convent, rectory, and a basilica styled on those of the baroque era in Europe. Everything was paid for with donations. “Father Baker’s Boys” are famous as products of the orphanage and vocational school who became fine Catholic men and pillars of community and Church. And it is worth noting, that not one child was ever molested, beaten or otherwise abused, right down to our day. Maybe that should count as a miracle1 Father Baker’s Cause for sainthood was opened in 1987. 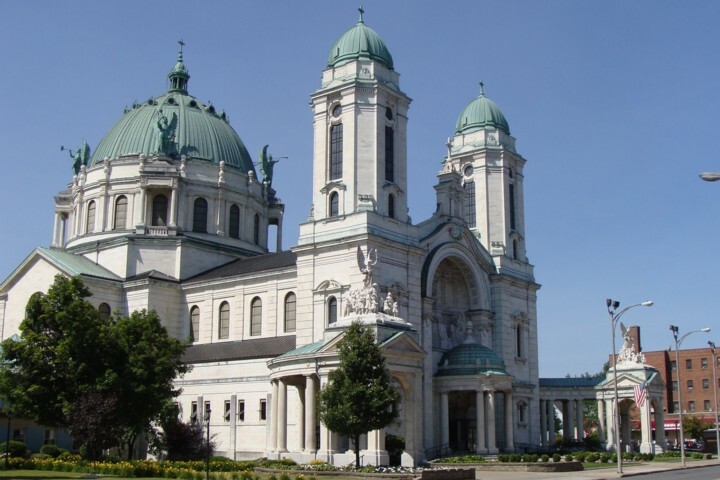 His body was moved from Holy Cross Cemetery into the magnificent church he built. Scroll down for pictures of the church and then of Fr. Baker himself.